If you’ve read through our Solving the Agency Maze, Working the Web, and You Call Yourself a Professional articles, you’re already dialed in on the need for creating a strong, recognizable brand for yourself. We’re going to assume that you have a handle on the business in general, that you’ve given some careful thought to the type(s) of modeling you’re interested in, and that you’ve worked through the agency-vs.-independent modeling decision. What we’re going to talk about in this section are the printed materials you need to represent that brand to potential clients. The business world calls these presentation materials, and they’re usually designed as a package with a consistent branding theme. Typically the presentation package includes brochures and business cards, letterhead and envelopes, and packaging materials. Fortunately, a model usually only needs two presentation items: comp cards and a portfolio book. At the end of this article, we’ll also talk a little bit about optimizing your images for display in your on-line galleries. You may be wondering if you still need printed presentation materials in the digital age. After all, you’ve given your Facebook and Twitter accounts a face lift to make them look more professional, and you have portfolios on six different model networking sites… is anybody still asking to see a paper resumé? The short answer is yes, especially for commercial and fashion modeling jobs. The formal portfolio book is expected and if you don’t have one when you show up for a casting call or interview, you may just get sent home. Glamour clients, on the other hand, might or might not ask to see your book. Agencies rarely handle glamour models and most work is already being scheduled from Internet contacts where potential clients may have already seen your online portfolio. Still, even if the client doesn’t ask for it, the mere fact that you have a book is impressive—it shows you understand the business and have made a professional commitment to equip yourself with the tools of the trade. Moreover, the first “client” you present your comp card and portfolio to could very well be a modeling agency. The best way of talking an agency into representing you is to show up for the interview fully prepared with your impressively professional presentation materials under your arm. Agencies spend a lot of time and effort grooming new models to a professional standard just to get them ready to start assembling their presentation materials; if you walk in ready to work—that is, prepared to earn money for the agency from Day One—you jump to the head of the line. That actually brings up a question new models often ask—if you’re working for an agency, whose responsibility is it to provide the presentation materials, and whose brand goes on them? If you’re an XYZ Agency model, shouldn’t your comp card feature the XYZ brand and contact info? First, let’s get one thing straight—you don’t work for the agency, you’re not their employee, and they don’t pay you a salary. The fact is, they work for you, and you pay them to perform a variety of services with a percentage of the money you receive from the modeling clients who actually do pay you to work for them. In reality, very few agencies can provide enough work to enable all of their models to earn a full-time living, and no agency has access to all of the work that is available in any given market. That should suggest to you that if you want to stay busy, a significant portion of your jobs will have to come through other sources—either through your own networking efforts and attending open casting calls or from other agencies that also represent you. If you’re represented by several agencies (very common, especially in smaller markets) or you’re representing yourself, the only brand that is common to all job opportunities is you, and the only reason to sign exclusively with a single agency is if that agency can reliably line up all the work you want. If not, their insistence on branding your presentation materials with their own logo is neither reasonable nor a requirement. It’s your career; you need presentation materials to pursue it successfully, and those materials need to work for you. The only commercial models who don’t need a book or a comp card are pre-teen children, for the same reason you don’t send them off to school every day in $100 shoes that they’ll outgrow in six months. A growing child’s appearance is constantly changing and it would be wasteful to commit extensive resources to a portfolio book that would be outdated by the time it was finished. Consider that you’re going to be working with photographers, make-up artists, stylists, and art directors—people who are visually creative and accustomed to working with sophisticated imagery. You shouldn’t have to be told that the materials you use to promote yourself as an equal member of that team need to be of the highest possible quality. Your photos have to be professionally produced modeling images. Your cell phone pics won’t work; neither will your high school senior portrait. They may both be exquisite enough to make your mother cry, but they’re not portfolio photos. For those, you need a model photographer, so either dust off your negotiating skills and find some soft touch you can talk into a TFCD session, or be prepared to hire a working pro who knows how to produce the kind of images you need. Quality make-up isn’t optional for these either, so expect to dig down again for that. The concern for quality also applies to your comp card, which needs to be sized correctly and professionally designed with an appropriate mix of images. So what, you’re asking about now, is an “appropriate mix of images?” What should you put in your portfolio book (and just what is a “comp card” anyway)? The answers can vary depending on the market, so let’s take a look. The portfolio book is exactly what it sounds like—a book of photos showcasing your modeling work. Also referred to as a “portfolio case,” “model portfolio,” “model book,” or just “portfolio,” the portfolio book is your first, best, and sometimes only opportunity to sell yourself to a prospective client. Beyond just proving that you’re attractive, the book needs to demonstrate your versatility as a model—your age range, your ability to portray different characters, your best features, and above all, your personality. Especially for commercial work, don’t just settle for a series of haughty fashion poses on white seamless paper—think high-end catalog shots where the models seem to be engaged in an activity. Look approachable and friendly. Icy beauty gets attention, but so does a bright personality that makes people smile. This is where you collect the dividend on all that work you did earlier in identifying the genres that align your modeling interests and physical characteristics. Your portfolio needs to highlight your ability to be a star in the kind of work you want to do. If you don’t know what that is, and you’re trying to hit a little bit of everything in your book, or worse, you’re showing photos in a genre you’re clearly not right for, you’ll be wasting time and money and squandering every casting opportunity you get. You’ll get one chance to make that critical first impression, and your book needs to be perfect. Talk it over with your photographer and shoot with a well-thought-out plan designed to capture exactly the kinds of images you need to showcase your unique talents and market yourself in the genres you want to work. The photos in your portfolio book should tell a very specific story about you, so clarify the narrative with everybody involved before you start shooting. Bring lots of outfits, by the way. You do want your story to suggest that you’re an experienced model who’s been around for awhile; you don’t want your portfolio to look like it was all shot in the same day. Don’t use more than one image from the same recognizable location or showing the same clothing in your book. How many photos do you need? First let’s emphasize a basic and inescapable point—the photos in your portfolio book must be professionally shot images of outstanding quality. Anything less is unacceptable and merely good cannot make the cut. (You can post those on your Facebook wall if you must, but don’t let a casting agent see them in your book.) Seriously, you need to be brutal about evaluating your own work, because your portfolio book should generally have a total of no more than 20 images, and they all need to be amazing. If you’ve only been working for a year or so and you can honestly (brutally) only find 10 images that make the cut, then your book has 10 photos, period. Quality is all that matters, and average photos that you include for filler will hurt you, not help you. New models will often have only 6-10 images in their books, and that’s acceptable. Industry-specific model portfolio books usually come with either 20 or 40 photo sleeves. The extra 20 are for your tear sheets, and after you’ve been working for a while, tear sheets will be your strongest and most effective images. Tear sheets are copies of actual advertising images that you’ve appeared in, literally “torn” from the magazine and displayed in your book. If your photos are the promise of your modeling potential, your tear sheets are the proof. Good enough is good enough. Your book should be durable and contain the specific features described in the next paragraph, but don’t buy more book than you need to accomplish the primary goal—displaying your photographs clearly and efficiently. High-quality, modeling-specific books can be purchased for well under $80 from a variety of vendors (see a sample list below), and carrying a $500 Corinthian leather case with your name embossed on it into an interview with a modeling agency representative just announces that you’re the kind of person who can be tricked into buying superfluous extras. Believe me, they don’t need that kind of encouragement. Most true modeling portfolio books have a solid cover that is wrapped in faux-leather, although rigid vinyl covers are common. Depending on how informal your market is, you may also see less expensive books with flexible covers. A nice feature available in some books is a pocket inside the front and/or back covers for you to store your comp cards, slides, or job vouchers. It’s important that the sleeves that hold and display your photos are crystal clear, and made of a material that won’t get cloudy or break down and secrete gases that damage your photos over time. Having the sleeves sewn into the cover spine is a lot neater and more professional looking than the 3-ring binder look. Most portfolio books are black, although it’s not uncommon to see clear covers these days, especially in smaller markets. If you’re represented exclusively by a single agency, they’ll probably insist that you carry their agency-branded portfolio book, which may feature the agency’s logo colors. If it’s your choice, get black; it’s traditional, unpretentious, and exudes business-class, like a grey flannel suit and a power tie. For decades, the standard size for a model portfolio book has been 9″ x 12″ and that size is always acceptable in every market. In a few of the larger markets, most notably New York, the more prestigious agencies might use 11” x 14” books. It makes for a very impressive presentation, but it’s also bulkier to carry around and more expensive to create and maintain. Tear sheets will usually be taken from a magazine page, which, in the U.S. usually means 8½” x 11″, which still fits fine inside the 9 x 12 sleeve. Actors always use an 8×10 book. Obviously, if you’re represented exclusively by an agency, your “preferred” size will be whatever they hand you. You’ll need your photos printed in the book’s nominal size, and 9 x 12, in particular isn’t a standard size for your local one-hour photo lab. Your photos should be in the portrait (vertical) mode, by the way; the person who’s looking at your book doesn’t want to have to keep turning it sideways to view landscape-mode photos. You can find decent 3-ring binder albums almost anywhere, including photography stores, framing shops, and business supply outlets like Office Depot and Staples. Most will have 8½” x 11″ sleeves, though actors may find 8″ x 10″ books at photo stores. Art-supply shops usually carry dedicated portfolio cases, although it’s unlikely you’ll find anything in general-purpose retail outlets that specifically displays the traditional 9 x 12 modeling portfolio photograph. For that, you’ll need to look at specialty shops that cater directly to the model and actor markets. One of the best is Portfolio Mart, which carries a terrific selection and range of affordable professional modeling cases in 9 x 12, 11 x 14, and 8½ x 11 sizes. The prices range from as low as $20 to as high as $80. California-based Itoya’s Art Profolio line is an excellent low-cost alternative to more expensive books. 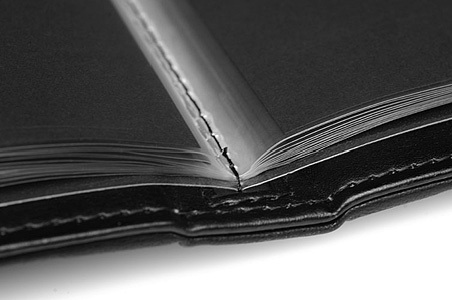 The Evolution EV-12-9, a clean vinyl-covered book with simulated stitching around the edges, can be purchased from respected online photo equipment giant Adorama, for example, for under $8. The PU-24-9 is a surprisingly luxurious case that goes for around $35. Itoya doesn’t sell directly from its website, so you’ll have to track down one of the distributors listed on the site. We’ve purchased numerous items from both Samy’s and Adorama over the years, and can recommend either one. If you can find an Aaron Brothers Art & Framing store in your city, you may be in luck—at least some of the outlets carry Itoya portfolios. Boise, Idaho models rejoice—there’s one in town and it carries Itoya products. If you really can’t resist the urge to flash the ritz, Brewer-Cantelmo offers custom made portfolios with prices to match. If you got it, you might as well flaunt it, but if money’s tight, hiring a good photographer to upgrade your photos is a better investment. There’s a limited number of potential clients who will be impressed by the fine leather and embossed name on your book, but everyone can appreciate superior photos. The Composite (Comp) Card is your modeling business card. It’s also occasionally referred to as a Zed card, a mispronunciation of the Sed Card named for Sebastian Sed, an early developer of the product. As the generic name indicates, the comp card is a double-sided composite of the model’s photos printed on card stock. The standard size is 5.5” x 8.5” which is a letter-sized (8.5 x 11) document cut in half. The usual format is a single strong image on the front, with a diverse selection of 3-5 images, plus the model’s basic stats on the back. If the portfolio book is your modeling story in pictures, the comp card is the sizzling movie-trailer highlight reel. Everything said above about creating an impact with your portfolio book goes double for the comp card. You have a maximum of six pictures to create a favorable impression of your personality and demonstrate the range of your talent. Your front-side picture, especially, has to stand out. Imagine that you’re a commercial photographer who’s just landed a contract to provide all of the images for a clothing catalog; or you’re an advertising agency art director who’s about to start production on an advertising campaign. It’s your job to find models for the assignment. You could call models you’ve already worked with, except that the client wants fresh faces who haven’t already appeared in his competitors’ advertising. You don’t have time to post a public casting call and risk not having the right people see the notice, so you email your requirements to a modeling agency and ask them to send you a list of their people. The agency immediately sends you a huge stack of comp cards. Even that might take too much time, so you go directly to the agency’s office and ask to look through an even bigger stack yourself. You may very well find—in no particular order—all of the agency’s model comp cards arrayed on a display rack. Here’s what’s going to happen—you’re going to pull the fifteen or twenty cards that jump up and grab your attention and spread them all out on a table top. Again, the six to ten cards that stand out are going to get picked up and carted back to the office for a final decision by the creative team. At every step in the process, if the feature image on the model’s card isn’t an attention grabber, it doesn’t make the cut. A quality comp card is an essential component of the working model’s networking tool kit. It sees the client before you do, and opens the door for you to come in for the interview; it stays with the client after you’re gone and continues to lobby for you. It’s your calling card when you’re trying to get an interview with a modeling agency, and as you walk out the door, it’s what you leave with the receptionist at the front desk. After it helps get you a job, while you’re sitting in the chair with the make-up crew, you ask them, “Do you mind if I give you my card?” and then you ask them if they have a card for you. The photographer asks if you have a card he can add to the file he keeps to remind himself which models he’s enjoyed working with, and which he can also pull out and show to any of his own clients who might ask for his advice on selecting a model. You give it to everybody. This is how you play the networking game, and the comp card is your ace-in-the-hole. The basic layout for your comp card is a full-page head shot on the front side with either your first-only or full name and no other copy, and a symmetrical display of four shots on the back, with your full name, contact information, and required stats. The key “stand-out” element, of course, is the quality of your photographs, but a striking graphic design can certainly help with the “wow” factor. If you’re graphically inclined, you can make your own basic design using templates at most of the printers listed below, and some of them also provide custom design services. Many model-portfolio photographers also offer comp card design and printing services (yes, we design cards and arrange for printing at Sourcelight Photography—well, you were wondering, right?). Cards should be printed on a good white card (not paper) stock with a minimum of 100# weight. Stock quality may also be expressed in point size, and anything over 12-point is acceptable. 14-point is excellent. Some companies also will apply a UV coating that adds a glossy sheen and a bit more perceived weight. The perception that presentation materials for models and actors have to be black-and-white is a holdover from the days when color printing was second-mortgage expensive, and B&W was simply the only medium most people could afford. That’s all different now, and most comp cards are in full, rich color. Can you still use black-and-white? Of course—it never goes out of style, and a well-shot B&W is always impressive. You won’t get a break on the printing costs, though, which should tell you how affordable color has become. There are three processes you’re likely to encounter when you’re researching printers. The cheapest is color laser printing, which has improved tremendously in the past few years, but still has problems rendering the kind of high-density color you find in model portfolios. It also tends to lose detail at the contrast extremes of shadow and highlight, and can’t print on glossy paper stocks. It’s not recommended for photographic documents where showing off the quality of the photo is the point of the document. The next step up in quality is digital offset printing, and the quality of the newest generation printers, like the HP Indigo Iris, is, for all intents and (most) purposes, photographic, and there’s no limitation on paper stocks. Since it’s a digital process, it works from files rather than mechanical plates, which means the setup is no more expensive for a single print than it is for a thousand. The process is relatively expensive, but since there’s no setup fee, offset digital can be an affordable option up to about a hundred copies. The most common high-quality color printing is done on a traditional, offset lithographic press. These are large industrial presses that apply CMYK color inks in 4 separate passes. Since the setup is often the most expensive part of the job, offset lithography is rarely affordable unless you need at least 500 copies. If you do, however, the per-copy price can be quite reasonable, and the quality is what you see in high-end magazines. Most Internet comp card printers will probably be offering either color laser or digital offset prints, although one, Color Comp Cards (see next), amazingly claims to use offset lithography, and their prices are only marginally more expensive than the other printers listed. Local printers. Don’t hesitate to contact local print shops. They know what they’re up against from the Internet vendors, and they’re often surprisingly competitive. Since they won’t specialize in comp card printing, their graphics departments won’t have templates and will be available for custom designs. I always prefer to patronize local business if I can rather than sending my money out of state, so at least give the locals a chance before you hit the Internet to check out the next few options. Zed Card Printers, Model Cards, Buy Comp Cards, Comp Card, and Comp Card Express are all Internet-based comp card printers offering basic products and services for reasonable prices. They’ll generally ask you pick a template and either upload digital files or mail in prints that they will scan and insert into the template. Several of them also offer basic design services if you don’t feel like populating a template yourself. I don’t have personal experience with them, so I can’t vouch for their quality or their service. Most do offer a free or low-priced print proof, so before you order 250 cards, be sure you approve the quality of their work. My Zed is quite possibly the most rudimentary do-it-yourself comp card creation site I’ve ever seen. If you’re determined to design your own card and following simple written directions is too complicated for you, this is the Sesame Street version. Needless to say, the templates are… straight-forward. Color Comp Cards uses the premium custom offset lithographic printing process and offers some of the highest quality printing and card stock available. The cost is a bit higher, but not significantly so. They also offer custom design services, and in fact boast that they don’t use templates. This also means that you can’t build your own card on their site, although if you (or your designer) are capable of creating your own design without a template, you can send any of the printers listed here a finished file. Printing costs for everything have lowered considerably with the advent of digital printing, and color comp cards are now reasonably affordable. Most of the printers listed above start their prices at around $100 for 100 cards, and the price drops to under $200 for 250 cards. As mentioned, Color Comp Cards is a bit higher—$139 for 100 cards—but the promise of photographic quality from an offset lithographic press is certainly worth looking into. Obviously, if you could afford it, buying your cards in lots of 500 or more could potentially drive the price down to pennies per card, but I don’t recommend it. Especially in a small market, 250 cards should easily get you through a year, and as a new model, you’ll probably want to update your card with some of the new photos you’re going to be posing for. Mini-comps are comp cards reduced to business-card size (2” x 3.5”). You can design them just as specialty one-sided business cards, with a single image and your contact information on the front, or create them as actual mini-comp cards, with an additional picture and all of your contact info and stats on the back. Most of the printers listed above also offer minis. Obviously you won’t get the visual impact that you would with a full-size comp card, but mini-comps are certainly more convenient to carry and in some circumstances may be less intrusive to hand out. Handing someone a comp card is an unmistakable marketing gesture, which is fine if the recipient is embedded deeply enough in the industry to expect it. People who are only marginally involved with the modeling industry, however, and who might raise an eyebrow at your comp card wouldn’t think twice about receiving a simple “business card.” Minis are not a substitute for a full-size comp card, but if you can afford it, they’re a very nice complement. Finally, a few tips on optimizing your photos for online portfolio display. For a more general discussion on choosing a portfolio site and making a splash with your verbal presentation, see our article on Working the Web. Your images need to be sized to fit the expected display space provided on the modeling site’s interface. Some of them pop up a non-resizable window and if your image is larger than the window, it will fall outside of the display and have to be scrolled for full viewing. That’s annoying. Even without the window, you have to anticipate the average resolution setting on most monitors. That dimension has steadily grown over the years as monitor prices have fallen and people have upgraded the size of their monitors. At one time the average monitor was a 14” display and the largest practical resolution was 800 x 600 pixels. If you tried to display a 1000-pixel-wide image, 20% of it would fall off the monitor. Now that affordable flat screens are available, the average monitor size is probably 19” or more, and the default resolution is going to range anywhere from 1280 x 1024 pixels all the way up to 1600 x 1200. Conservatively then, that should mean that anything smaller than, say, 1200 pixels wide by 1000 pixels tall should display without scrolling. As a practical matter, however, a few model networking sites limit image size to no more than 800 in the longest dimension. If you upload a larger photo, they’re going to compress it using their crappy site algorithms, and you’ll likely wind up with a heavily pixelized JPEG mess. Consequently we always deliver our model files at a maximum dimension of 800 pixels on the longest side. It’s big enough to provide decent detail and quality, but small enough to fit all displays without scrolling. Oh, and the model sites will leave it alone. A word about DPI (dots per inch), by the way. There’s a lot of misunderstanding about this term on the Internet, and you may come across some confusing discussions in the forums of your model networking site. Images are usually tagged with a DPI rating, usually something like 200 or 300 for print and 72-100 for monitor display. The monitor-display setting is an irrelevant holdover from an earlier era, and you can safely forget about it. DPI has nothing to do with monitor display; it is strictly a print specification that tells a printer how many ink dots to spray inside of an inch of paper space. An inch is always an inch on paper, so if your 1200-pixel-wide image gets sent to the printer with a 300 dpi specification, it’s going to print at 4 inches wide (1200 ÷ 300 = 4). If you told it to print at 200 dpi your 1200-pixel image would be 6 inches wide, and so on. Your computer display, however, is measured in pixels, and the number of actual inches of display that will create is a function of your resolution setting. Here’s an example. Let’s say you have a monitor that measures 14 inches across, and let’s say you’ve set your resolution (remember, it’s a Preferences setting; you can vary it) to 1280 pixels wide by 1024 pixels high. That means that one inch of actual distance on your computer monitor is going to contain approximately 91 and a half pixels ((1280 ÷ 14 = 91.43) or, roughly 91 ppi (pixels per inch). So how many inches wide is your 72 dpi, 640 x 480 image? As you’ll see, that’s strictly a function of the relationship between your actual, fixed monitor screen size and the arbitrary resolution that you selected for display. Since a 640-pixel-wide image will occupy exactly half of a 1280-pixel-wide display, and since your monitor screen is 14” wide, your image will be 7 actual inches wide. If your monitor was 20” wide your image would now display at 10 inches wide using the same 1280 x 1024 resolution. On the monitor, it makes no difference whatsoever what dpi setting you specify; your monitor ignores it and displays the image according to its actual pixel count. Clear as mud? All you need to remember is that when you resize your image for web display, make the long side 800 pixels. Since most of the images we deliver are in the 9 x 12 portfolio aspect ratio, that usually means a 600 by 800 pixel image. We also try to strike a healthy balance between a fat, juicy bit count for maximum quality and a decent respect for the site’s bandwidth/display concerns. You’ll have the option when you apply the final JPEG compression to choose a quality level, and we always shoot for something that yields a file around 150-200k in size. Again, big enough to maintain some quality, but small enough to load quickly. And, just for kicks, set the dpi specification at your age. For some of us, that’s a pretty respectable number. The answer is a complex problem with a simple fix. The colors in your photos look desaturated and inaccurate because you’re using the wrong color space. Say what? Accurate color is actually a very complex challenge to reproduce. Creating a particular shade of blue in the typical 4-color print process, for example, requires a very precise mixture of the base cyan, magenta, and yellow inks. It’s called CMYK, with the K referring to black, since a pure black is hard to create by simply mixing the other three. Accurate color also has to take into account the relative whiteness and reflectivity of the paper the photo is being printed on, and every paper stock will require a custom color formula to create the same color value. Those formulas can shift over time as printers age and inks and paper are replaced, so pro labs recalibrate their process almost daily (which is why we don’t enthusiastically recommend that you have your Sourcelight photos printed at the local WalMart 1-hour lab). Color on your computer monitor, however, is created and displayed by shining a back-light through an equally complex mixture of red, green, and blue pixels. It’s called RGB, and there are 256 levels of each color, ranging from deep, saturated color to an almost washed out version. When you multiply 256 x 256 x 256, you get nearly 16.8 million color possibilities. The tiny differences between any two adjacent colors are far too small to be processed by the human eye, which is in fact the basis for JPEG compression. JPEG’s sophisticated, bio-based algorithms simply evaluate the image and eliminate color differences it knows we can’t detect anyway by creating an average value of any 16-pixel grouping. So if we can’t see them, why do we need so many colors in the first place? Because color in the real world, meaning the visual landscape you capture in a camera, is actually a broad spectrum of mixed shades. Accurately depicting a blue sky requires thousands of shades of blue from the darkest to the lightest points in the sky; throw in a deep red sunset on the horizon, and you’re up to millions of colors. Why does all this matter? Consider the simple problem of trying to match a computer image’s colors in a print—one is made with combinations of red, green, and blue light; the other is comprised of a completely different mixture of cyan, magenta, and yellow ink. It would be a lot easier if the processes used the some component colors, but since they don’t, making them compatible requires the use of extremely sophisticated conversion formulas. How does a little bit of R, a little bit more G, and not very much B translate into some comparable mix of C, M, and Y? Figuring it out can take a lot of time-consuming calibration and expensive trial and error, and in the end, the conversion is never perfect. RGB simply doesn’t translate perfectly into CMY, and the prints we get from digital files are always a compromise. We have similar problems inside of digital display. CRT monitors can display colors differently than flat-screen LEDs. Expensive professional monitors show more colors more accurately than cheap consumer models. Software programs that deal with color all have their own ideas about how to create the RGB-mixing formulas. How do we deal efficiently and consistently with those 16.8 million colors so that they all look the same in every circumstance, in every software program, on every monitor? The question got prickly and real as the Internet evolved from a text-based medium to a visual medium. The eventual answer was the sRGB color space, a lowest-common-denominator standard for displaying color on a computer. In 1996, Hewlett Packard and Microsoft got together and asked the basic question: “What is the minimal performance standard we can expect from the average consumer computing system—OS, software, display card, and monitor?” If you‘re interested, you can read a technical presentation about the process here, but the gist of it is they were looking for a consistent method of managing color so that it would display in a similar manner across the widest possible spectrum of display devices. The specification they created, sRGB, has indeed become an industry standard and is now the defacto display mode for all Internet-based color. The problem is that in order to make it compatible with home-based computing systems, the standard was deliberately dumbed down to encompass only the limited range of colors expected in consumer-level displays. It’s quite possible that the system you’re reading this on is capable of displaying richer and more natural color than you’re seeing, but you won’t see it because all of the images have been translated to the reduced-spectrum sRGB standard. Professional image producers typically work in a larger color space that doesn’t limit the full range of color available to them. The most common professional color space is Adobe RGB, a standard created by Adobe for use in their image-processing programs like Photoshop. More colors mean better fidelity to the original image throughout the process, from camera capture through professional printing. In a professional system that recognizes and can support the broader color space of Adobe RGB, colors will also display accurately on a computer monitor. Unfortunately, when an Adobe RGB image is displayed on consumer-level equipment that is expecting the smaller sRGB range, weird things can happen. Colors get washed out and are often displayed inaccurately, particularly in the blue and green range. Most notable are typical red skin tones, which turn a sickly green (see the example below). If your photo looks color-accurate on your monitor in Photoshop but green on the same monitor when displayed in your modeling portfolio, then either the modeling site or the browser you’re using is incapable of reading the color-space info planted in the metadata and is simply defaulting to sRGB display. Some browsers, Firefox for example, are smart enough to detect the color space and display your images correctly; others—Microsoft’s Internet Explorer, for example (no surprise)—can’t read color space tags and always default to sRGB. The solution? 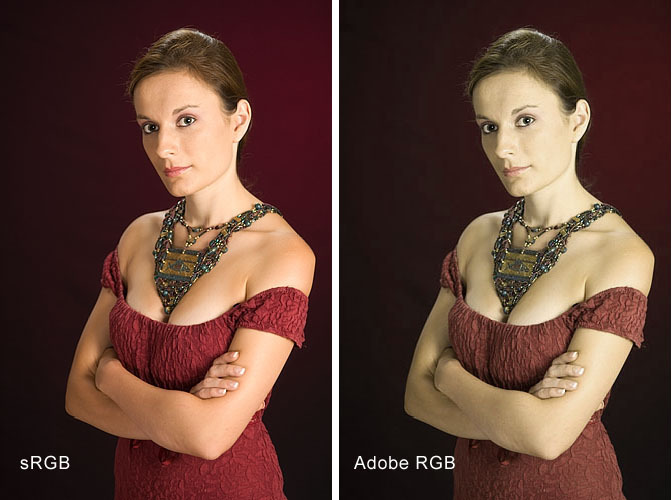 Before you upload your Adobe RGB photo files to an Internet-based display, convert the color space profile to sRGB. Be sure to use the “Edit/Convert to profile” rather than the “Edit/Assign Profile” option. Photoshop understands the process and applies sophisticated algorithms to minimize the damage, and unless you have some extreme and unusual color ranges in the image, you probably won’t notice a difference. Sure, it’s annoying to have to essentially degrade the quality of your images in order to accommodate the arbitrary limitations of a display medium, but it beats letting Model Mayhem recolor your images on the fly.